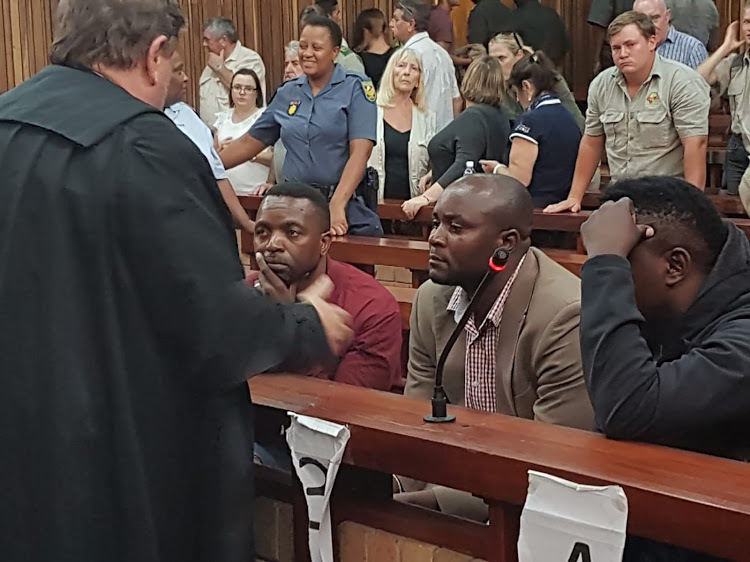 The three members of the notorious Ndlovu poaching gang were yesterday each sentenced to an effective 25 years in prison for their role in decimating the rare rhino population in the Eastern Cape. Zimbabwean citizens Jabulani Ndlovu, 41, Forget Ndlovu, 38 and South African Sikhumbuzo Ndlovu, 39, were convicted of some 55 criminal counts involving the poaching of 13 rhino over four years in the Eastern Cape for their valuable horns. Similar fact evidence produced during their trial suggested they were suspected of poaching many more rhino in the province and elsewhere. Judge Jeremy Pickering’s sentence was greeted by spontaneous applause from the packed public gallery. The three men stood expressionless when during the sentencing judgment. The courtroom was packed to capacity with members of the public, poaching units, private game reserve staff, Green Scorpions and the Eastern Cape Parks and Tourism Agency staff. The Ndlovu’s senior counsel Advocate Terry Price indicated they intended applying for leave to appeal against both conviction and sentence.